I realized last night that new Nets owner Mikhail Prokhorov, a Russian oligarch, strikes a passing resemblance to Sir Simon Milligan, Kevin McDonald's character from The Kids in the Hall sketch "Pit of Ultimate Darkeness, "a man possessed by demons, polite demons that would open a door for a lady carrying too many parcels, but demons, nonetheless." Well, maybe more of a cross between Kevin McDonald's Simon Milligan and John Malkovich's Teddy KGB from "Rounders." Both Milligan and KGB, it should be noted, are caricatures. 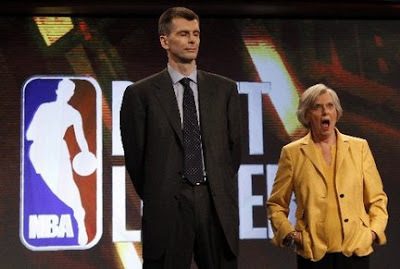 Prokhorov, with his billion-dollar portfolio and promised "element of surprise," should be considered as such.